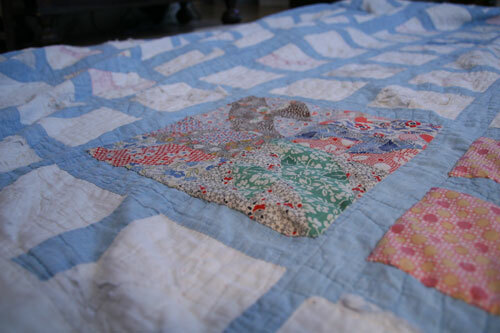 Well, sort of–I fixed an old bow-tie quilt that I bought for $15 about seven years ago or so. I loved its pale sun-bleached colors, but it was tattered with a big ugly brown stain that kept it tucked away in a closet for years. But I kept it with the belief that one day I’d fix it or use it for something else. Of course that day coincides with being in my 41st week of pregnancy when you are so desperate to do something with your time other than write negative reviews of Yelp to Mr. Stork and eviction notices to your unborn child. It started out quite innocently on my last day of work when Jen and I wandered into a little store in the Mission called The Bell Jar where they had some pretty vintage quilt squares for sale. I bought two thinking I could use them for the quilt, which came out of the closet when I was looking for a bit of extra bedding. 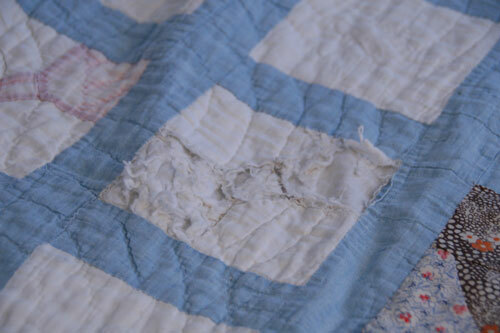 And here is a close-up of the ruined squares that I thought I would fix in my spare time. I forgot how much I enjoy hand sewing. It was calming and something I could do and feel like I was being productive that didn’t involve lifting heaving objects or playing with deadly chemicals. 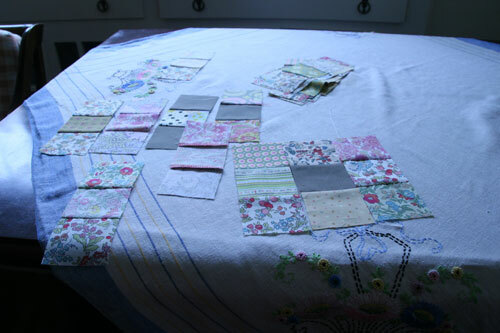 As I worked on the quilt, I saw more and more little patches that needed fixing. If nothing else this quilt was a great excuse to raid my fabric stash and sew up little nine patch squares using up the sweet squares I bought from Alicia Paulson’s site ages ago. She’s got a great eye for color. And I must admit, I didn’t hand sew them–I ran them through my serger. So naughty! 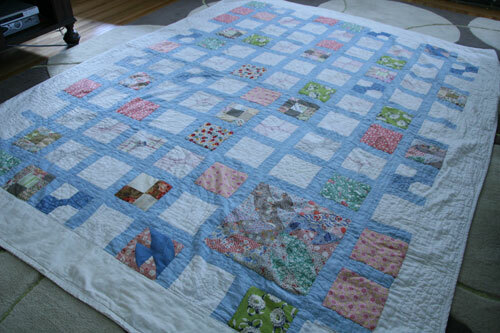 I like it so much, I’m taking it to the hospital with me for my post labor room. They recommend having a nice blanket to personalize your room. And this one is very personalized and is part of my story for the Peach. I think she’ll like it too. You are, quite possibly, the craftiest person I know. Thanks for all your recent posts — they help me keep tabs on your progress. Oh my!!! Good luck and I can’t wait to see your nursery. I just found your blog yesterday and I’m hooked. I think I read through all your archives in one sitting. You’re so cool I’ve decided to live vicariously through you so please keep posting. I’m so excited that I’m a vicarious member of the devilettes!! And I’m having a baby too!!!!! 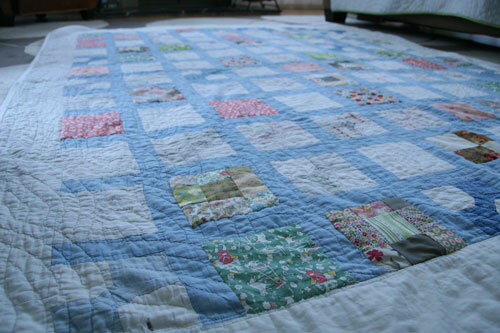 I love handsewing as well.. Good idea to fix an old patchwork, the result looks fantastic !